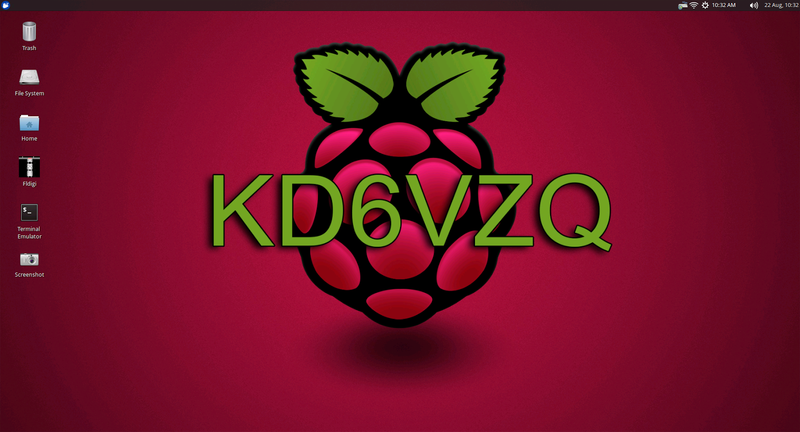 KD6VZQ's Amateur Radio activities and projects. This morning I was asked if I knew of a website that had a good general over view of APRS. As much as I would have liked to provide and answer. I could not. So with a little help from an old owners manual I'm going to try and give an overview here..
With APRS you will need 4 items. If you are not a Ham or Amateur Radio Operator. A transceiver would be a radio transmit and receiving unit used to communicate with radio waves through the used of specific radio frequencies. Much like your cell phone. A TNC, is a Terminal Node Controller. It converts packets to audio tones and audio tones into packets. It does this by using the AX.25 Protocol at the Data Link Layer of the Network OSI Model. 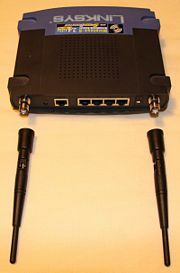 This allows for a computer or a TNC capable radio to communicate over the radio waves. Much like the internet of the old days with a modem. You would use a modem to modulate an audio signal over the phone line. Another example would be a fax machine. A Global Positioning System, or GPS is recommended, but not a required item. You should be able to manually set your GPS coordinates. Though if you are mobile with a vehicle, its suggested that you have a GPS. Again not required but recommended. Some radio / TNC systems will just need a GPS antenna. While other systems might actually need a full GPS for you to connect to your TNC / Radio. Best to read your owners manual for a more proper answer to your gear. I've recently discovered a device called Mobilinkd, which uses your cell phone and a GPS. Software is where all the magic happens. In more recent times newer radios have their own version of software. It actually firmware because it is inside the radio. Any software that is embedded in hardware is always known as firmware. Since the OSI networking model is being used and the AX.25 protocol in place of the Data Link Layer. Its just a matter of knowing a few commands / responses. You could actually run an older TNC in terminal mode and do everything manully by hand with a command line in a terminal window. The APRS software program and registered trademark of Bob Bruninga, WB4APR. 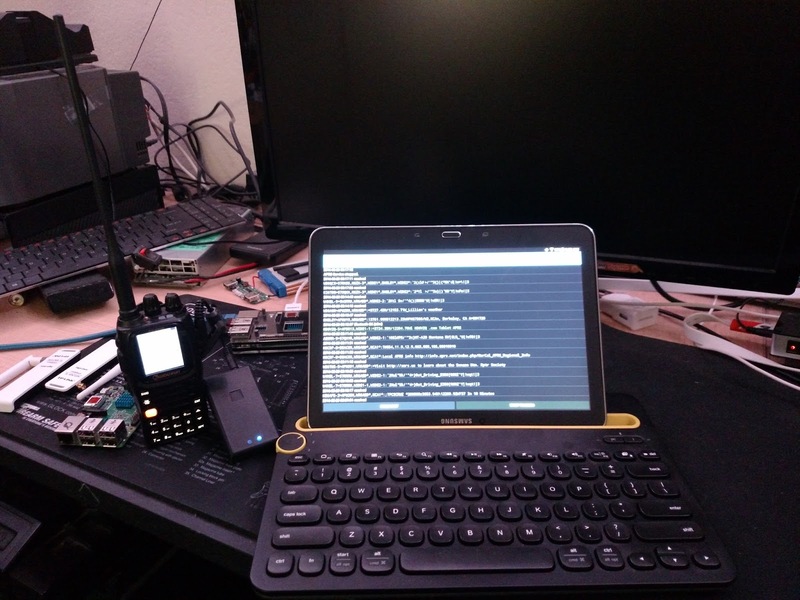 He has made packet communications much more exciting than before.This program allows you to track mobile stations on a map which you recall on a computer screen. Imagine seeing one mobile station moving on the map which can be scaled from .5 to 2000 miles. You also may be tracked on the computer screen of another station. For stations to be tracked must transmit beacons at certain intervals. Now that you have an APRS setup. What can you do... ? I'll tell you what I"ve done in the past.. you can go from there.. I've used it to allow up to a few minutes update as to where I am in my vehicle. Someone I know has a habit of calling my cell phone every 20 - 30 minutes asking where I'm at. Now I just provide a link in email and refer them to it..
Tracking shuttles during large volunteer events. Weather Stations reports to local hams. Relay short text messages from one radio station to another. If you search around on the internet, you'll see there are many tracking purposes, and you might come up with some ideas of your own.. I hope that this provides you with enough information to get you started with APRS. Before getting started here. I would like to thank Scott WZØW for the resource and idea he presented. It provided some new and fresh ideas regarding APRS. I think Wikipedia explains it well. "Automatic Packet Reporting System (APRS) is an amateur radio-based system for real time tactical digital communications of information of immediate value in the local area. In addition, all such data are ingested into the APRS Internet System (APRS-IS) and distributed globally for ubiquitous and immediate access. Along with messages, alerts, announcements, and bulletins, the most visible aspect of APRS is its map display. Anyone may place any object or information on his or her map, and it is distributed to all maps of all users in the local RF network or monitoring the area via the Internet. Any station, radio, or object that has an attached GPS is automatically tracked. Other prominent map features are weather stations, alerts and objects and other map-related amateur radio volunteer activities including Search and Rescue and signal direction finding." 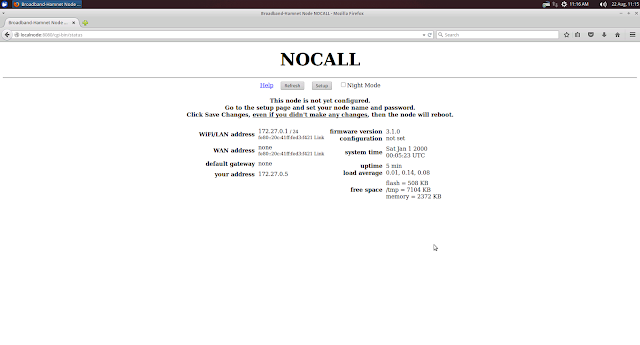 I first got started with text over Ham Radio by playing with TNCs (Terminal Node Controller). This allowed for me to send digital text information over the local radio waves. it was cool and easy for the novice techie to understand. It was a lot like the old BBS systems I used to visit with my computer. Just over Ham Radio. For you young folks a BBS was pre-internet days of computer techies communicating and sharing information with each other. You used a modem and a phone line to connect to other systems. Most BBS have moved on to least costly activities with the internet. Not to mention being able to reach a broader audience. A blog site is a great example of an old BBS. However, a BBS did not have a graphic interface like we do here on the web. (BBS was short for Bulletin Board System) There are still a few around today. 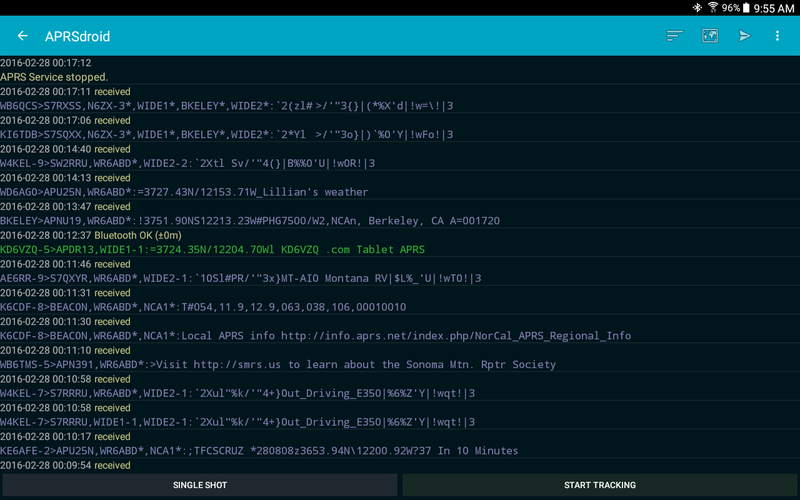 Moving on to APRS on tablet..
As per discovery from reading Scott's site. I got myself a Mobilinkd device, much like Scott did. I found this device handy for two reasons. I have an old Kenwood TM-D700 which is one of the first mobile radios that came with a TNC installed to allow for APRS. Other than being installed in a vehicle, it is rather bulky to carry, and battery is heavy. Not very practical. A HT and a Tablet or Phone is quite a bit easier to carry. Gotta love technology. 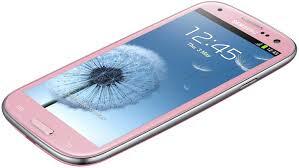 Mobilinkd does have a setup process that they have generally documented. Took me a few tries to understand what they were wanting for the hardware setup to be. Also they have DCD setup by default. In their documentation they state that it needs to be on. It was not working with my tablet. But once I turn it off, everything was working fine. Following directions is good. but sometimes you gotta think out of the box. On both my phone and tablet. I have used APRS Droid on and off during the last couple of years. 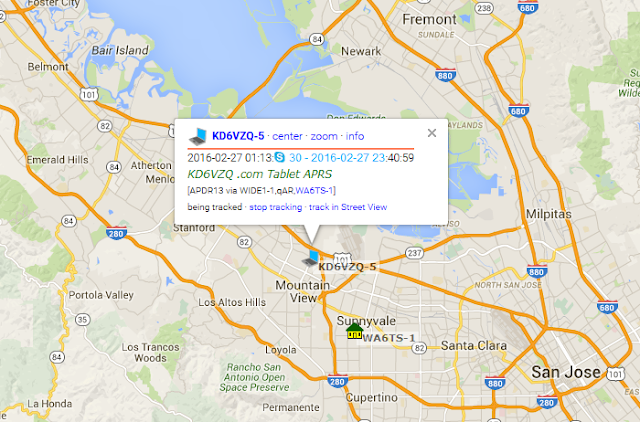 I have found it to be one of the better apps for APRS. 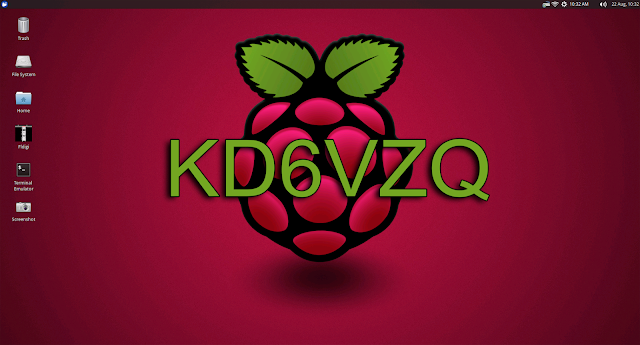 For us who are fans of the Raspberry PI. You can install some software named Xastir for APRS. You'll also need some additional blue tooth hardware for your pi. A little USB adapter $5 - $10 can be found at your local tech store or Amazon. Xastir did not work for me. But you can still give it a try. You can refer to Scott's page, on how to get Xastir installed. After trying Xastir, I felt really disappointed with the software. Its about 6 years out of date and leaves you wanting some much needed functionality. The maps are out of date. So much so that if you select the wrong map from the options, you'll be stuck for about 1 minute on your screen from map to map. I was only able to get two of the maps working out of the several that are listed. 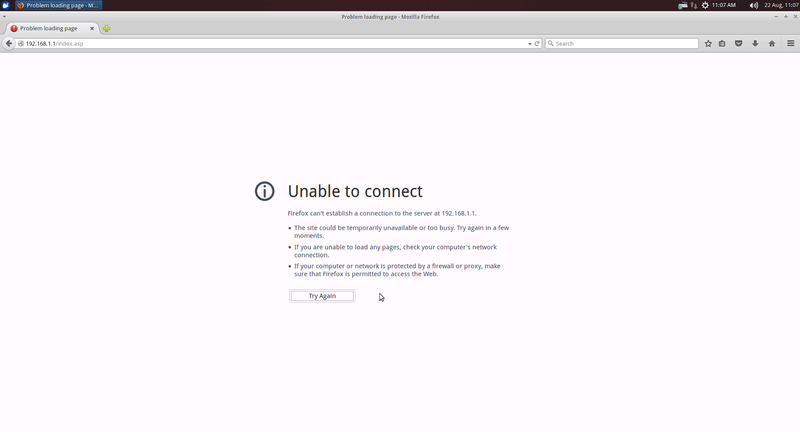 The software attempts to reach locations on the internet that are no longer available. (For example http://mm.aprs.net) The locations are where maps are / were stored. They are no longer there. Once I was able to get my bluetooth TNC to work, software would still not transmit my packet information over the airwaves. I would hit the transmit now button, and nada! Receiving stations were just as bad. I would get garbage in the text, as if I had selected the incorrect baud rate for comms. All in all, Xastir has a lot of catching up to do. Xastir may have worked for other hams. But certainly not for my Raspberry Pi setup. My cellphone did much better than this. Stepping back to Mobilinkd device. Of the three options I tried. There is only one device with any active GPS. Well, its not a real GPS, It simply gathers information from local systems to triangulate on your current position. So long as you stay within range of cell phone sites, your GPS function on your cell phone would work just fine. If you do manage to travel abroad and out into the boonies. The GPS on your phone will stop working the moment you loose your cell phone signal. Just something to keep in mind. With a little trouble shooting. I'll have to say that the Mobilinkd device worked as expected. I feel its a good item to add to my Ham hardware collection. 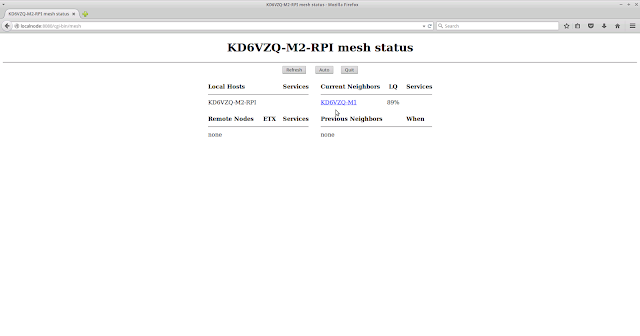 I have a working Mesh Network. What do I do now? This seems to be the main question Hams have after getting a Mesh system working. I even had the question myself. I had the question because the information around the internet comes in bits and pieces. It was like being on the internet while participating in a scavenger hunt for pieces of a puzzle. So here I’ll try and make it simple for you. A Mesh Network is created by changing the firmware on standard home internet routers. 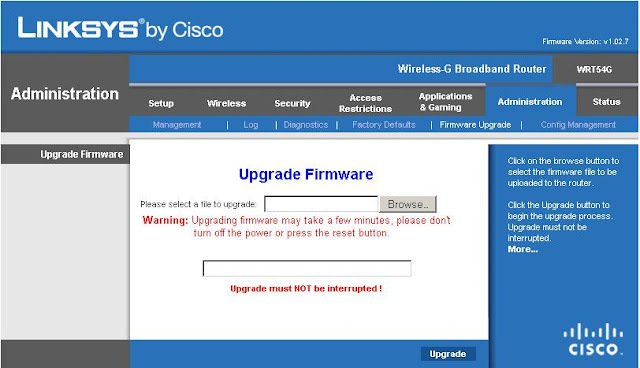 Once the firmware is change, you change on how the router works. It can only be bridge to extend a network (Mesh), or an Access Point connected to a Mesh Network. That is demonstrated in my blog " Wireless Video Over Mesh Network "
If you are wanting a full and complete understanding on creating a mesh network. Be sure to read my other blogs on creating a Mesh Network. Now for the answer you’ve been waiting for. A Mesh Network is a network that you build yourself. In essence it is its own internet network. Depending on what you would like to do with your network. You might need some additional hardware. Like a Server, or a Cloud system for file transfer. 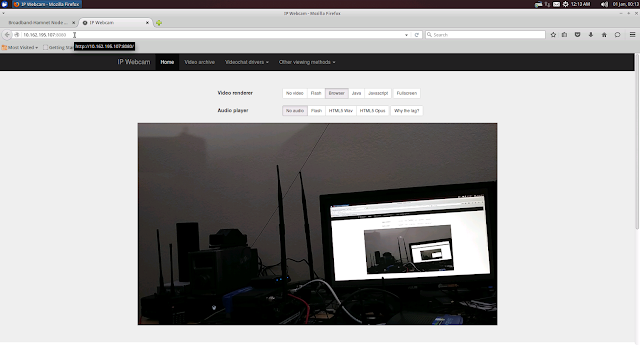 To prove that mine worked, I chose to do streaming video through the Mesh Network. 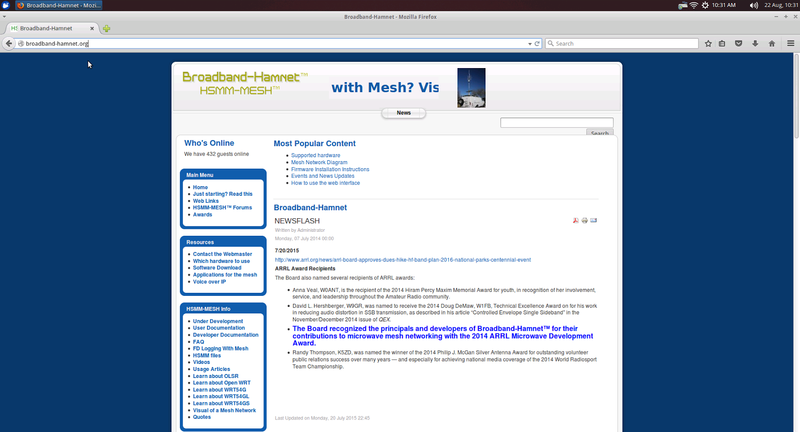 As demonstrated in my blog " Wireless Video Over Mesh Network ". Now that you have that basic concept and understanding. Here is a list of some items that Hams have done with Mesh Networking. VOIP (Voice Over Internet Protocol) Voip would be a phone system. Like Cisco phones at the office. Remote control link between house and Ham Shack. 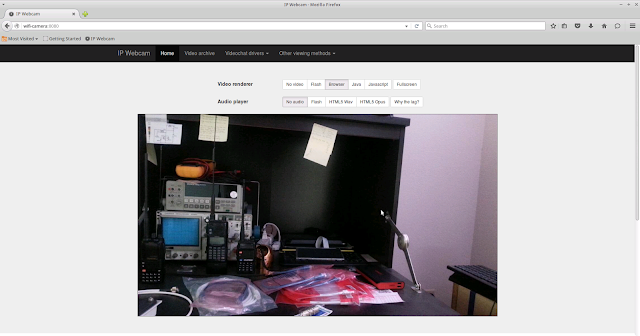 There was a Ham Group in Texas that supported a marathon by using a wired camera through a mesh network. Which brings me to my next point. Why a Mesh Network? Hams have the license ability to use part of the WiFi frequencies. Because it falls within their license rights. This allows for Hams to experiment with power output and Antenna systems. Legally extending the range of a Wifi Mesh network. In the case of the Ham Group in Texas. They extended the range between each router to 10 miles. I hope this answers some of your questions about Mesh Networks. And maybe even give you some ideas of your own. Yes! I did it. And I'm excited to share with you all; how to setup a cell phone converted to wireless video camera. Transmitting both Audio and Video through a mesh network. To fully understand how I got this far with mesh networking. I suggest reading my previous blogs for detailed how to step by step directions. It also provides a wealth of highly detailed information I have found during my research. If you are going to follow what I did here. You're going to need a cell phone you can use as a camera. In my case I used my old cell phone, as well as my new and current cell phone. They both worked equally with no trouble at all. Next I would suggest using cell phone software similar to IP Webcam Pro or Third Eye - Wireless Monitoring. One works with Android the other with Apple IoS. You may or may not have to pay a small fee for use. Now for some ground rules to get your network working. 2. Each router will need to be the same model and able to take the same version of Firmware. Follow these two simple rules, and you will save yourself a lot of trouble shooting when your system is not working. You might have to do some trouble shooting, but those rules will knock out most of the issues off the bat. 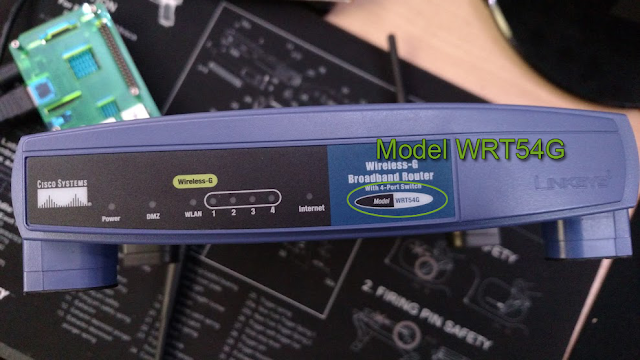 Some models of the same brand of router, will not have the same WiFi-Transceiver chip. If there are different Transceiver chips you may run into some incompatibility problems between two routers. 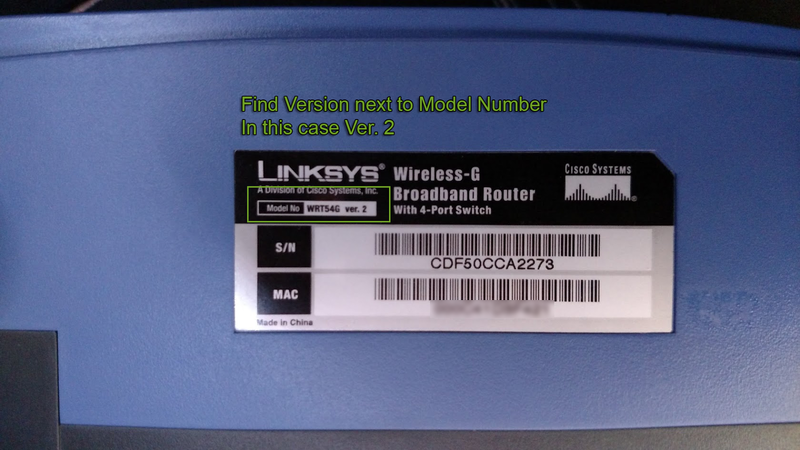 You can often determine the chips by looking for a router version number. Most likely placed near the sticker with the serial number. Or close to the Mac address. In my mesh system, I'm actually using versions 1, 2, and 3 of the same model. but since they all have the same transceiver. I run into no issues. There may also be memory space issues. Also determined by version number. Needless to say, when you choose a router. try to get 3 - 5 of the same model and version if you can. If you're cheap like me, you might end up getting used routers from a used store somewhere. some of which might not be working. so on the side of error, I chose to get 5. If they all work, then you have the ability to expand your network without the hassle of looking for more. To do what I did, you will need to sacrifice one of your mesh routers and make it an Access Point. In general, an Access Point will allow for you to have the ability to use WiFi over your mesh network. Example: Internet ---> Mesh Gateway --> Mesh Router --> Access Point --> Wireless Device. For you to make your mesh router into an Access Point, you'll need to first upload new firmware to the router. The firmware will first turn the router into a Mesh Router. 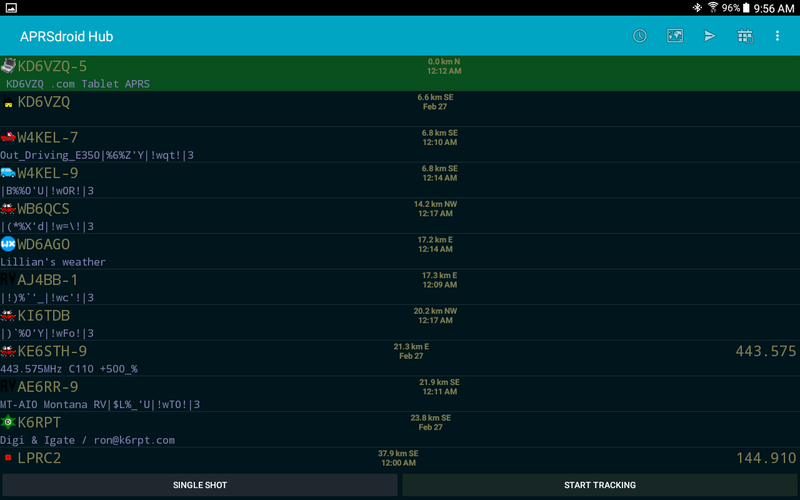 Within the setup feature of your router, you'll need to define that the router is to be used as an Access Point. How to upload new firmware; can be found ( Here ). Once the new firmware is uploaded, you'll need to test the router and see if it is working. 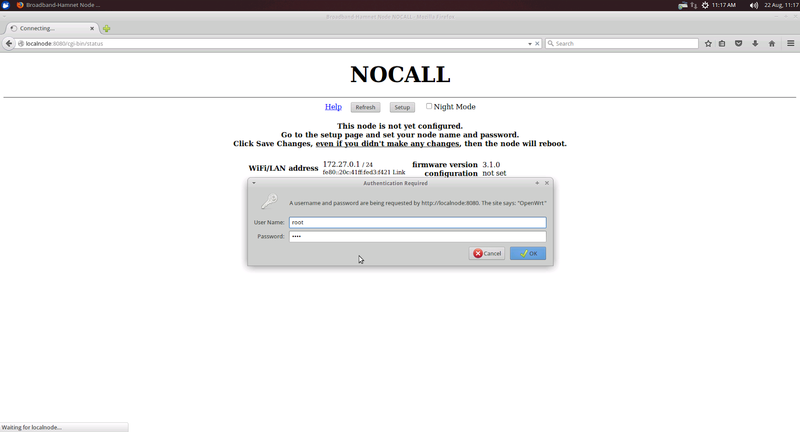 If you get the screen above by typing LOCALNODE:8080 in your url address bar, then your router is in working condition after you upload the firmware update. now click on the SETUP button. Type in ROOT for username and the default password hsmm. 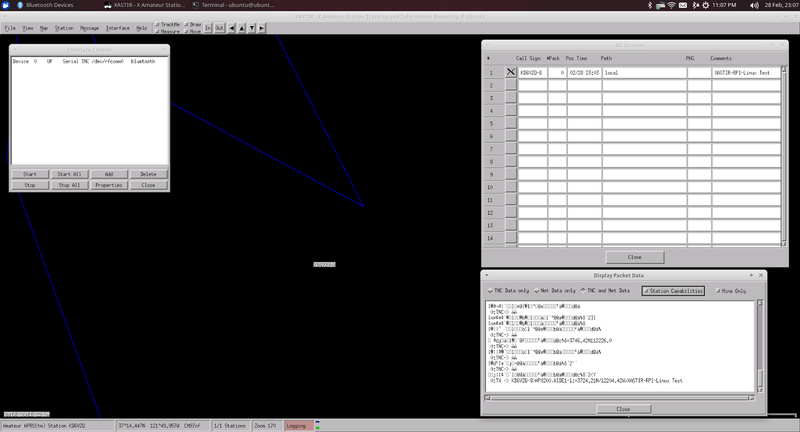 Next to Node Type, select Mesh Access Point. Change your SSID for your access point. Example: KD6VZQ-AP. Save Changes and then Reboot router. Once you reboot this router it becomes and access point. you will no longer be able to configure it by going to LOCALNODE:8080 because there is no configuration needed. It just becomes a passive device that help you connect wireless devices to your mesh network. If you were to try and get a wireless device connected at this point it will not work. It will not assign an IP to your device at this time. The access point is basically a bridge between the wireless device and mesh network. 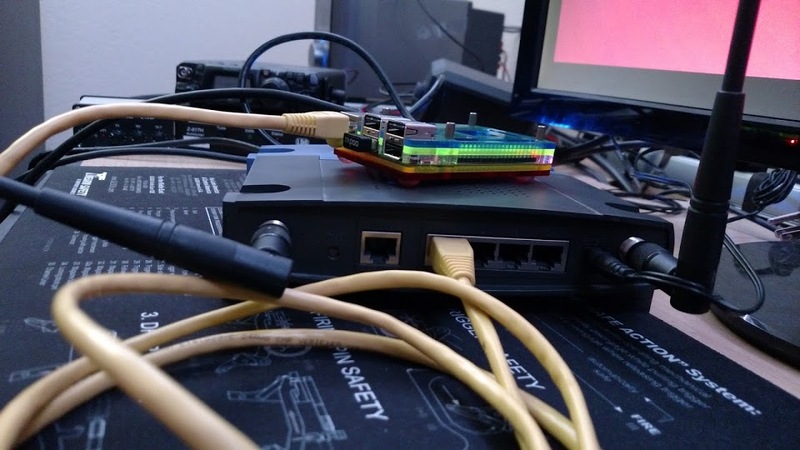 To get things working you would need to connect your Access Point to a Mesh Router that is already configured to be part of a Mesh Network. This would be an actual physical connection through the LAN Ports on the back of the Access Point and Mesh Router. Using the picture above as an example. The Access Point acts as a wireless bridge between the Cell Phone and Mesh Router. The Cell Phone will get connected to Access Point, but receives its assign IP address from the Mesh Router. You can test this by removing the Ethernet cable or Power from the Mesh Router. 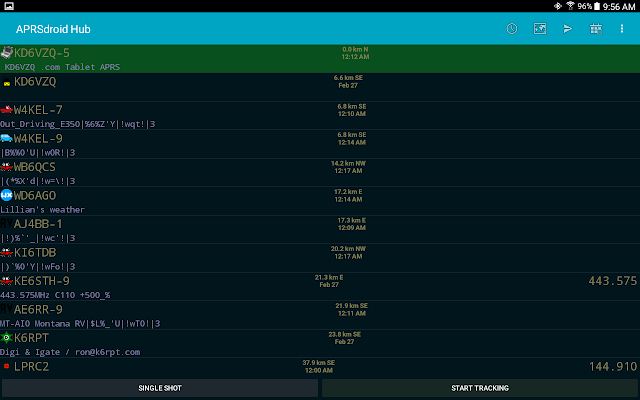 At this point you can also test to see if your Cell Phone camera is working with the assigned IP from the Mesh Router. Your phone should tell you what IP to type into your URL address bar. Now we have an IP to look for.. We need to connect a computer to the Mesh Router directly via a cable. No need to login to Mesh Router, just connect a cable. We would then make sure that our wifi on computer or laptop is off. This is to be absolutely sure that you are communicating through the Mesh Router. Computer is booted, Mesh Router connected to computer. 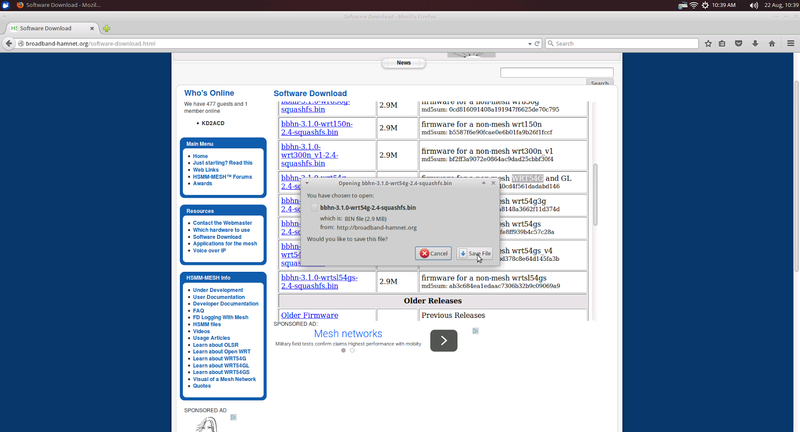 Open a web browser (Chrome, Firefox, IE, etc. 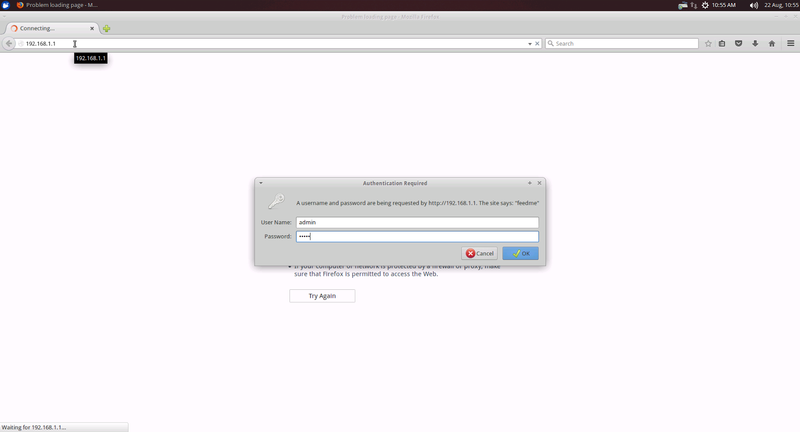 . .) and type in the IP address you got from the camera. Nice.. we're about 90% done. We now know that everything right up to the first Mesh Router is working. And Mesh Router should be relaying your signal through out the mesh network. But for the moment it is not. You would actually need to get Mesh Router M1 to announce the link of the Cell Phone Camera to other parts of the mesh network. 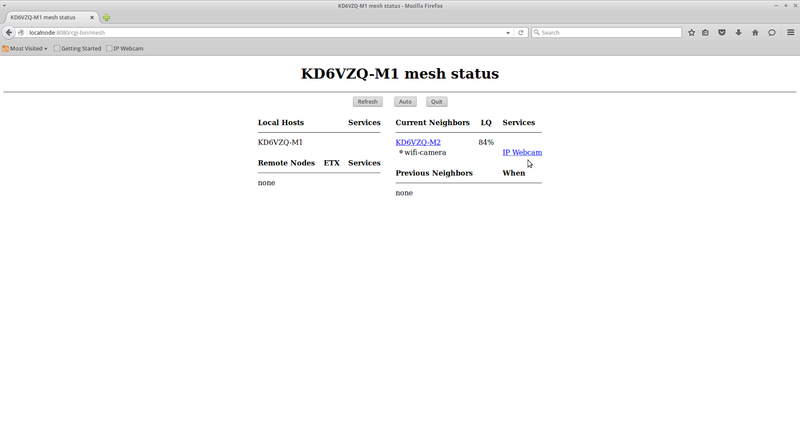 Login to your Mesh Router M1 and go to SETUP button at top. 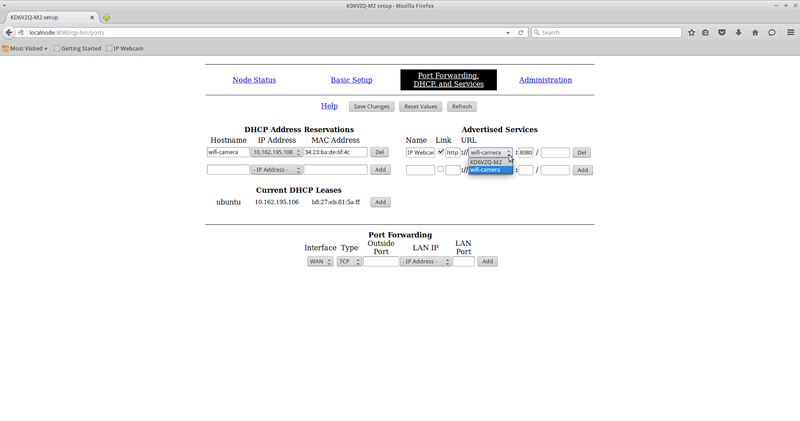 Once in the SETUP area, select Port Forwarding, DHCP, and Services. To the left under DHCP Address Reservations, you will want to select the IP your Cell Phone Camera was given. 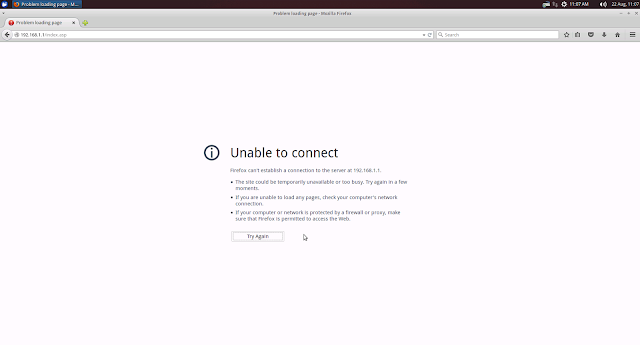 Then you will give it a HOSTNAME. 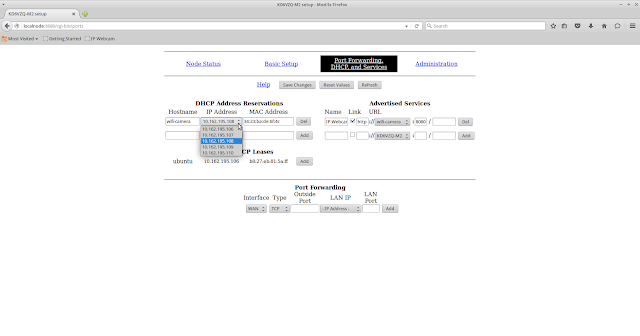 the Mac address should come up automatically.. if it does not, look to see if it isn't already listed under DHCP Leases. Click on ADD button when done. To the right under Advertised Services You want to type in a name for a visible link. Please a check mark in the Link box. 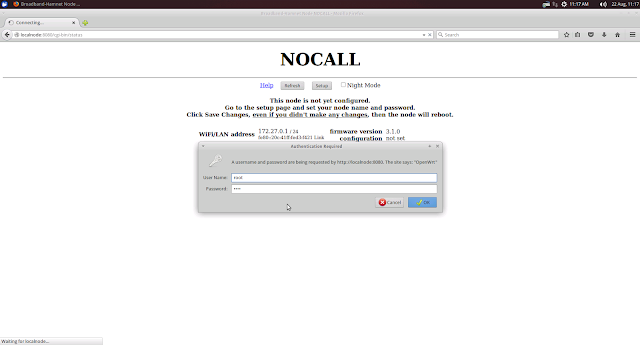 Define the protocol (IP Cams use HTTP for protocol) Look for the Hostname under URL. If you don't know the port number the camera is using, it will be defined in the URL the camera gives you. (Example: Http://255.256.254.44:8080) Most IP cameras use port 8080. click on Save Changes and then Reboot. All configuration is complete. 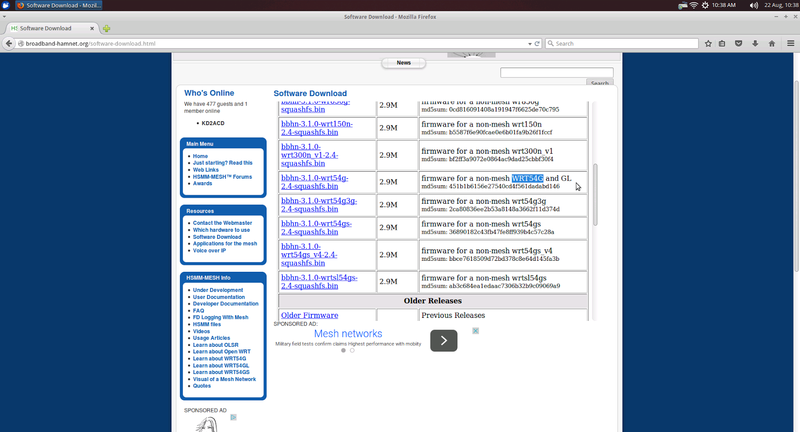 Next thing to do is to see if the other Mesh Routers see an additional link being advertised. 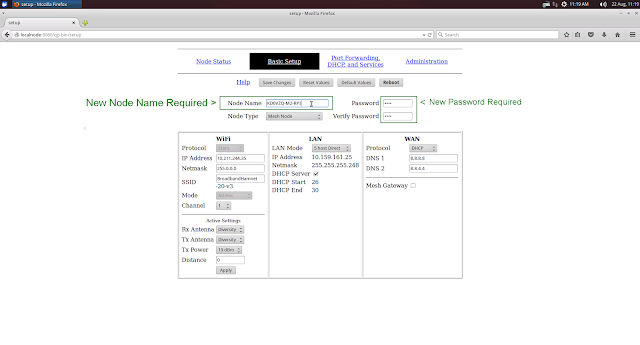 Login to the Mesh Router M2 using a Ethernet cable to laptop. 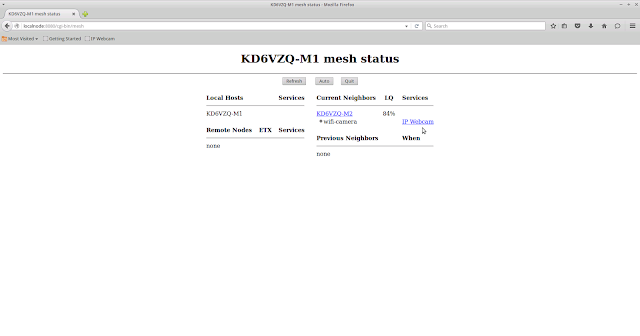 Go to the Mesh Status page by clicking button at top. Click on the link and your IP Camera should come up. 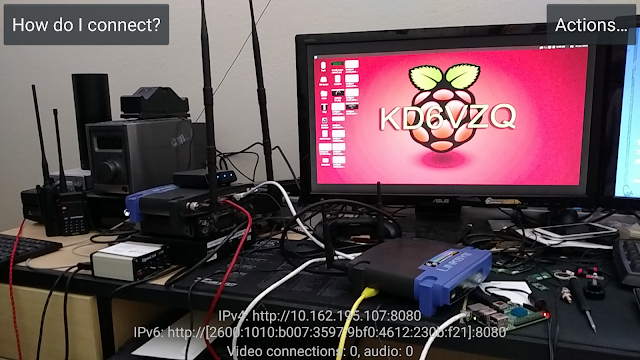 And there you have it, and Audio / Video signal over a mesh network. I hope that my Mesh Network series on my blogspot here helps you and future hams understand how to get a network in working order. Thanks much for reading all this wonderful information. Please feel free to share it with friends. If you have not already done so I would suggest reading previous posts I've created on this subject. It would help with understanding some of the geeky information I'm about to provide. For Hams, I'll be showing BroadBand-Hamnet. 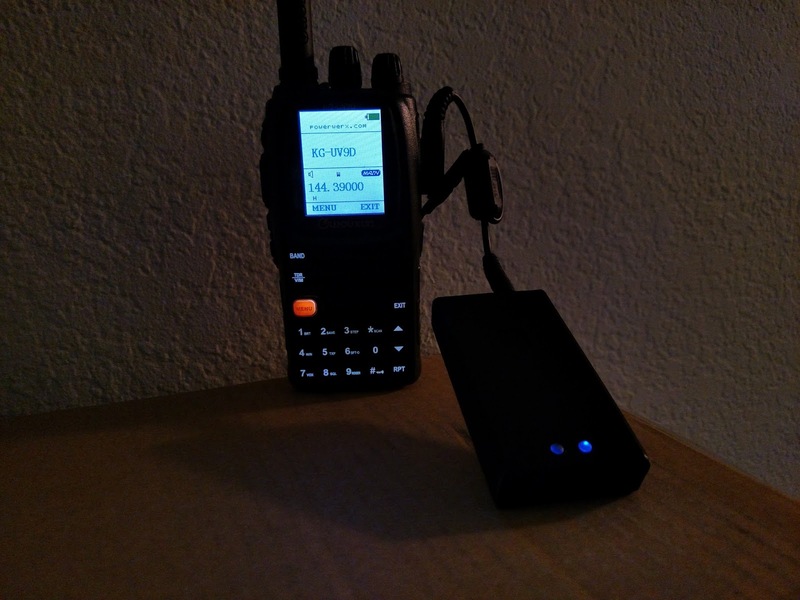 This is the firmware that is more focused for ham radio operations. I will not be demonstrating DD-WRT. For those of us who prefer a more advanced system, I would suggest DD-WRT. The information I'm providing here is all information on a larger puzzle. 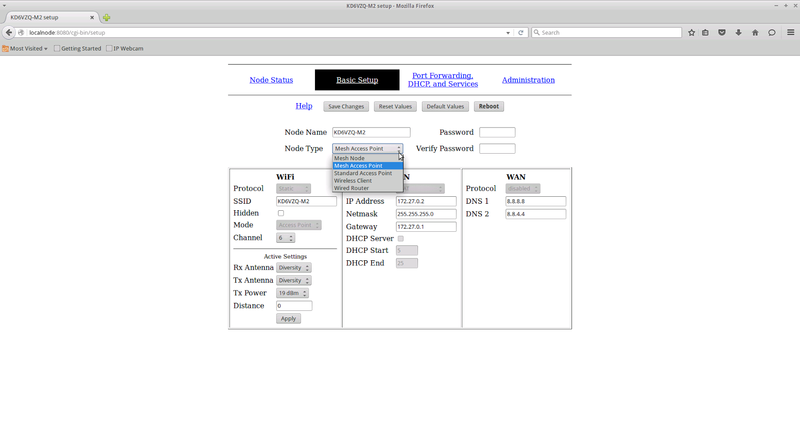 If after you get your routing system working, and in need of additional information for trouble shooting. My hope is that the information provided here will help you. If you are just wanting to install the firmware, you can skip to the installation process from here. Now for the fun stuff. NODE - Any system or device connected to a network is called a node. GATEWAY - A gateway is a network point that acts as an entrance to another network. In this case your mesh router connected to internet. WDS - Wireless Distribution System and is a feature supported by an increasing number of 802.11 access points. (AP) Simply put, it enables single-radio APs to be wirelessly connected instead of using a wired Ethernet connection. Think of this as wireless repeater mode. In this mode the router can communicate wirelessly with another router that supports WDS. MAC address - A MAC address is a hardware identification number that uniquely identifies each device on a network. The MAC address is manufactured into every network card, such as an Ethernet card, Wi-Fi card, or Router, and therefore cannot be changed. FIRMWARE - software that is embedded in hardware, allowing for hardware to do its function. Example: you do not need a computer to be hooked up to a router, in order for the router to work. The Router will function on its own with instruction from its own firmware. Pay close attention to Router hardware Make, Model, and Version numbers that you get. Reason being is that the Wi-Fi CPU ( Main Wi-Fi chip on circuit board ) needs to match the other mesh router Wi-Fi CPU. If it's the same chip Manufacture ( Broadcom, Atheros, Marvell, Ralink ) but a different version of the same chip. You have about a 50% chance of the two routers communicating. If the two chips were of same manufacture and version number. Then you would have 100% chance of communication between routers. If you were to have two routers from different manufactures, there is still a chance it will work. but it is a small chance. A big part of this is comes from Manufactures not wanting for there chips to speak with another manufactures chip. It would be like Intel and AMD collaborating to build the best computer in the world by sharing their technologies with each other. It simply just isn't going to happen anytime soon. You won't be able to know what chip a router has unless you were to take a look at the circuit board directly. Most of us most likely wouldn't want to do that. So I suggest that if you are not comfortable taking apart your router to look at the chip; you get multiple routers of the same manufacture and same version number. It might help reduce any trouble shooting you might need to do in the future. A common connection point for devices in a network. Hubs are commonly used to connect segments of a LAN. A hub contains multiple ports. When a packet arrives at one port, it is copied to the other ports so that all segments of the LAN can see all packets. A device that forwards data packets along networks. A router is connected to at least two networks, commonly two LANs or WANs or a LAN and its ISPs network. Routers are located at gateways, the places where two or more networks connect. Routers use headers and forwarding tables to determine the best path for forwarding the packets, and they use protocols such as ICMP to communicate with each other and configure the best route between any two hosts. Mesh routing systems act more like hubs. They repeat everything on the network. It goes in one port on a router somewhere in the mesh and gets repeated to all other routers and ports on the mesh. You can also use the mesh router as a gateway connection. providing access to another network or internet. Unlike nodes in a star topology, (star topology is your standard home network) which require a router to deliver Internet service, network nodes can "talk" directly to each other without requiring the assistance of an Internet connection. A big advantage of this decentralized topology is that there cannot be a single point of failure (SPoF). If one node can no longer operate, all the rest can still communicate with each other, directly or through one or more intermediate nodes. Mesh networks can use a full mesh topology or a partial mesh topology. In a full mesh topology, each network node is connected to all the other nodes in the network. In a partial mesh topology, at least one node connects directly to every other node while others may only connect to those nodes they exchange data with on a frequent basis. no music, no profanity, no business activity, etc. Maximum Transmitter Power Output (TPO) is 100 watts (or 50dBm), although we will probably never encounter more than a couple watts. The Node Name (included with every transmission) must include your call sign. Common practice is to append a few additional identifying characters (e.g., KD6VZQ-M2), since your call sign may be associated with several nodes. Only licensed amateur radio operators should be able to access Part 97 hardware (in this case, modified Part 15 devices). So, take steps to prevent unauthorized users. There are a lot of types of coax cables I'll list a few of the common ones in regards to Wi-Fi use. Wi-Fi radio transceiver effectiveness is described as a measurement of power output and receive sensitivity. Generally, these two measurements are expressed as power in milliwatts (expressed as mW, meaning 1/1000 of a watt) or as “dBm” (decibels related to 1 mW). Relationship-oriented means that there is no set value for a dB. The trailing letter in a dB measurement defines the relationship. For example, dBm means decibels related to 1 mW of power. 1 dBm equals 1 mW. When you know the value of the relationship, decibels are easy to calculate. Doubling by threes is due to the logarithmic nature of RF energy.When comparing a signal of 1 dBm (1 mW) to a signal of 3 dBm (2 mW) you see that it’s double the power. This doubling nature of power measurement or line loss makes it easy to see how a cable can quickly reduce the RF signal to almost nothing. In each case, it’s a large drop. But look at the difference! LMR-100 drops power to a tiny fraction of the original signal. LMR-400, on the other hand, while inefficient, still has a usable signal. In general the fatter and shorter the cable the better. No cable is even better; as there will be no loss to measure from a cable. Keeping loss in mind. If you're going to place your router 30 feet in the air. Plan on having a way to make it easily reachable in case there is a need for trouble shooting. You could get an amplifier, but they're still a bit pricey and hard to come by for the time being. By special request from various hams who know me personally. I'll be providing step by step instructions with screen shots. Instead of helping each Ham individually. I'll be helping a broad base of Hams all at once with these set of directions. If you have not read my previous post on Getting Started with Mesh Networking. I would highly suggest you read it ( HERE ). I'll be assuming that you have at the very least read that helpful information before moving forward. 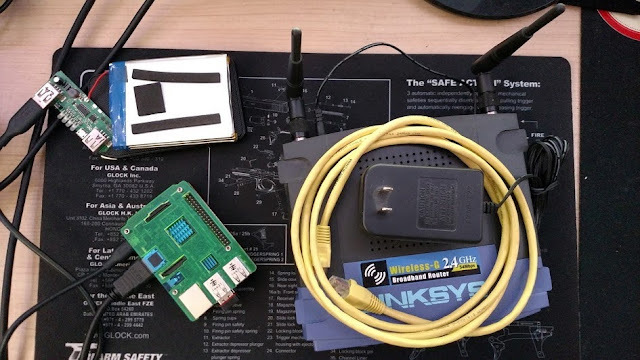 Also as this post is geared towards Hams getting started with understanding mesh networking. 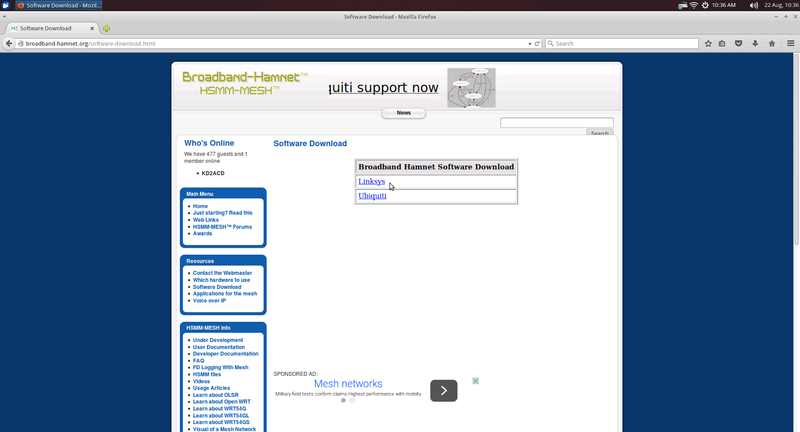 I'll be using the firmware provided by Broadband-Hamnet. One note about pictures and graphics. This free service from Google Blogspot is free. And I have limited control of the photo / picture size you might see. If you are in need of more larger details of photo. Simply click on the photo / picture and it will take you to the location of the original picture with greater detail. Find a Router you can use. I've already done the research ahead of time as to which routers I will be able to use. Hopefully you will do the same before you head out to purchase a used router. Be sure to check the bottom of the router for version number. Gather your tools of the trade. During this install I'm using my trusty Raspberry Pi B+ operating with Ubuntu Linux. I'm in the process of testing a battery with it as well. The Router I'm gong to use for this demonstration. A Cat 5 / Ethernet cable, and power supply for Router. Boot up the computer you are going to use to reprogram your router. Find your router in the list of available downloads for various routers. Download and Save your file to local machine. Once file is downloaded and save to your local machine, double check it has been saved. Next we disconnect our machine from the internet. Make note of where you saved the file on your machine. After we've confirmed that we are disconnected from the net. We hook up our computer to the router we are prepping to re-program. Take a Cat 5 cable and hook it to the computer, and the other end to one of the 4 ports on the back of the router. Plug the router power in and wait for about a minute for router booting process to complete. If you're are lucky. You have a router where the default username ( ADMIN ) and default password ( ADMIN ) has not been changed before your got your hands on it. If your not so luck. well its easy enough to get around that. Just a few extra steps. Though you may need to confirm the process with the manufacture if my suggestion does not work. 3. Continue holding the reset button down while your plug the power back in. 4. Still holding the reset button wait for router to complete booting. about one minute. In most cases this process works and resets the router to factory defaults. If it doesn't work you may need to find manufacture documentation on the process. You can usually find it online. After a successful login, your should see a similar screen. Click on administration to right. near top of screen. Then click on Firmware upgrade. Once you have located the file. Click on upgrade to start the re-programming process. After re-programming has commenced, you will notice that you will not be able to get to the router like before. This is ok. we just reprogrammed the router and it now has a different set up rules for operation. One of which is a different set of IPs to operate with. You will need to renew your IP address like you just did previously. After getting a New IP from the router. You should be able to login. So we open our internet browser and type in the following address. 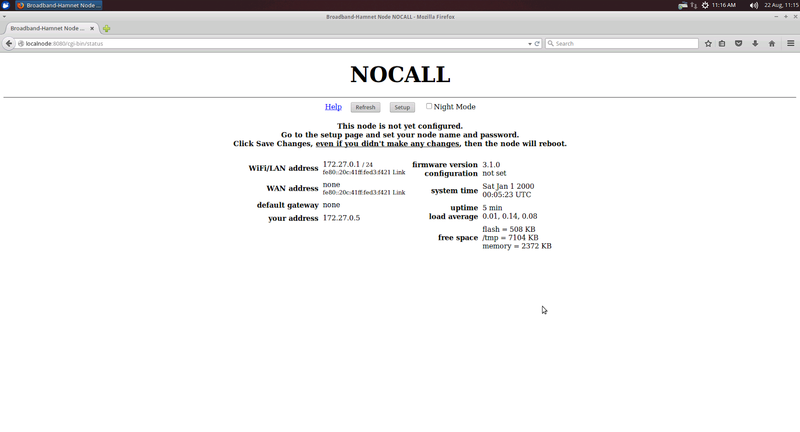 localnode:8080 to get to the screen above. Click on the Setup button to login to your newly programmed router. You should gain entry to the setup screen. Welcome to the setup screen. You will need to change two things before your router will work. First is to change the node name, preferably something with your callsign in it. 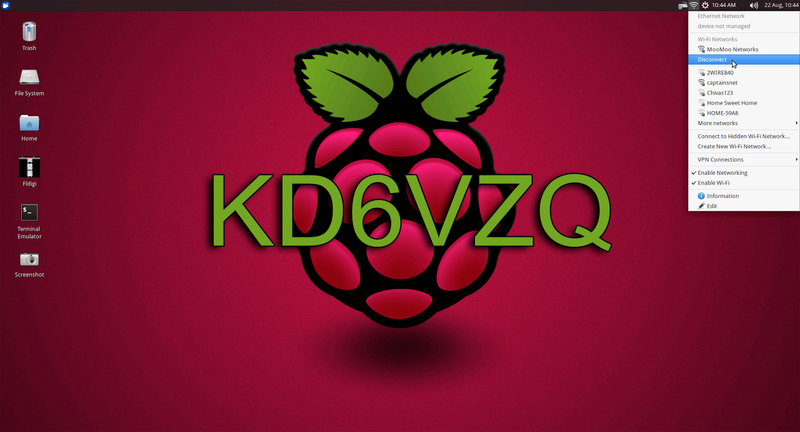 As you see in this example I put KD6VZQ-M2-RPI. place something with in reason in your node name. The second is a required password change. Make careful note what your password is. If you loose it, it will not be easy to access the router if password is lost. After making changes click on the Reboot button at top. Reboot will take about 2 minutes maximum. If router doesn't come back up you might need to restart the router and / or your computer. 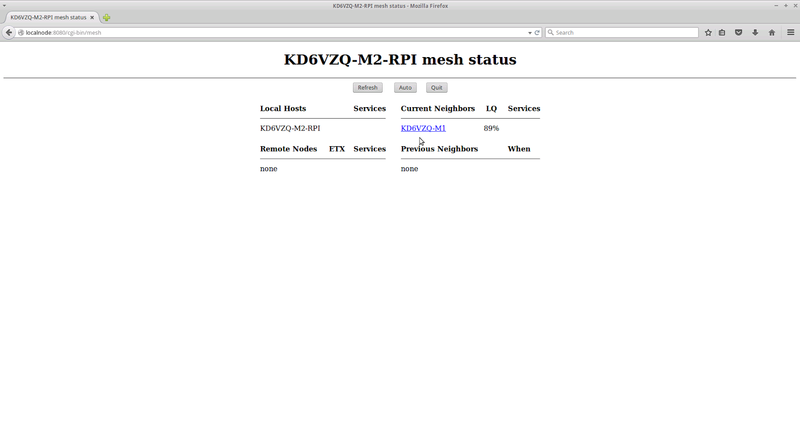 After a full reboot and getting back to localnode:8080 click on the button that says Mesh Status. it'll provide you with information on local mesh routers that is it connected with. Keep in mind that in order for a Mesh Router to communicate with another, its SSID must be exactly the same character for character. example: Hsmm is different than hsmm. Caps counts. If you have more than one working router. They will see each other and you will have started building a Mesh Topology network. Thanks much for reading this Mesh Networking post for Hams. I hope that the information provided during this post had some value of helpful information for you. If you don't understand what a Mesh Network is, I provided a 3 minute blog ( HERE ) for your reading pleasure. After you have caught up to speed, you can move forward with Mesh Networking for Ham Radio Operators. During this blog I'll be providing some important information that might make your head spin. If your head starts to spin, just know that some of this information is just FYI and need to know. If your head still spinning after that, I would guess to say that you are trying too hard. Read the information in chunks and take a break. In the end you'll see just how easy to reprogram a router, and make it a mesh router. From there its just a matter of deciding what it is you want to do with your Mesh network. You're in luck! As a Ham Radio Operator you have a license to operate within the commercial wifi bands. This is possible because our FCC License overlaps the same set of frequencies that commercial wifi routing systems use. See chart below for Part 97. Part 97 falls under Amateur Radio Rules & Regulations. Our Ham license allows us higher power and higher gain antennas. You'll notice that we have 13 cm and 5 cm frequencies ranges. 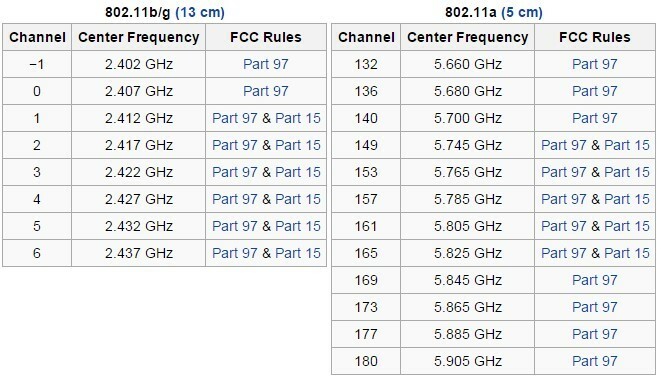 From personal experience I can tell you that 13 cm or 2.4 GHz frequency range is a good place to start because equipment is cheap. Allowing you to practice and to understand at a lower cost. However 2.4 GHz has more devices all over your metropolitan area. And, as a result, you will hear more noise on this band. Now that you understand which frequencies you are allow to use. The next logical question is what hardware can I use? Below is a sample list of routing hardware the you can get on the shelf. Whether it be your local electronics store, good will, or a friend saying that they don't use it anymore. If you don't know your router number and version number. 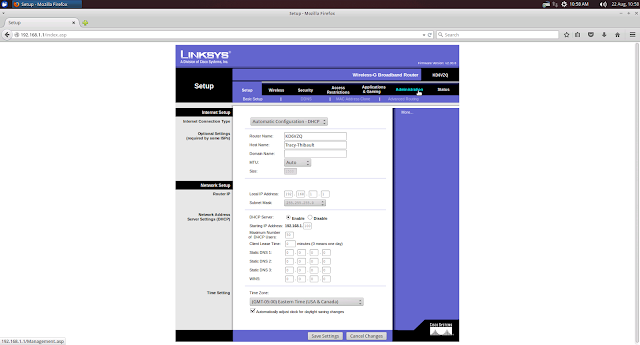 The graphic below uses a Linksys router as an example. Other routers will have a similar identification system. If your are looking around for a router to use, I would like to take this opportunity to suggest getting a router that allows for you to detach the antennas from the router. This will allow for you to add a better and upgraded antenna system. Adding a better antenna system increases strength of signal and usable distance. Now for the next piece of this puzzle.. Firmware. . .
For those of you who do not understand what Firmware is. It is basically software that is being run from within hardware. In tune with this Mesh Network subject. It is the software within the the router that allows for it to works as a router. And the routers firmware is independent of your computer interface. It does not need your computer to load and run to make the router work. Linksys routers were not originally able to be used as mesh networks routing systems until after Linksys started using a Linux based software (firmware) to run their routers. After Linksys started doing this. other companies soon followed. 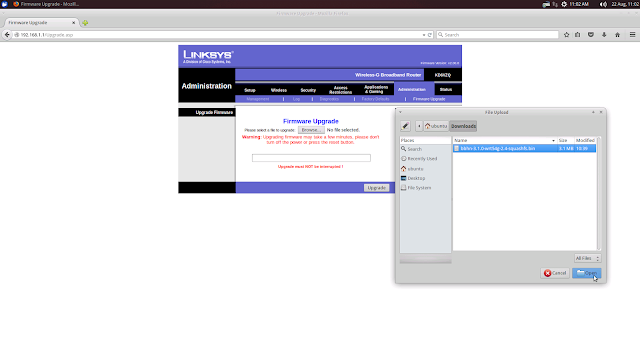 Linksys did this mainly to allow themselves flexibility to update the firmware on the router. This also allowed for hobbyists to create their own version of firmware and load it to the router. Changing how the router works. Making it into a mesh router. In general Wireless Mesh Networks were a Military application that eventually bled over to civilian applications. MIT is a good example of this with their One Laptop Per Child (OLPC) project. After finding your the hardware you would like. you need to make sure that it works. by simply plugging it in and logging into the router. If you are unfamiliar on how to do this. Simple go to the manufactures website and download a pdf version of the owners manual. If you have a used router, and don't know the password to login. You may need to do a factory reset to set the factory defaults on the router. This erases all info on the router. After seeing if the router works. You'll need to find the proper firmware to download from BroadBand Hamnet or from DD-WRT depending on your router and application for use. Almost all Ham Radio Operators will use the Broadband Hamnet firmware. Now you have a copy for the firmware you would like to use. you'll need to upload it to the router. I'll use Linksys again for this example. NOTE: Before doing the following steps be absolutely sure you have the correct firmware. As you might notice in this example; you would first go to Administration tab, then to Firmware Upgrade at the top. Taking you to this menu. 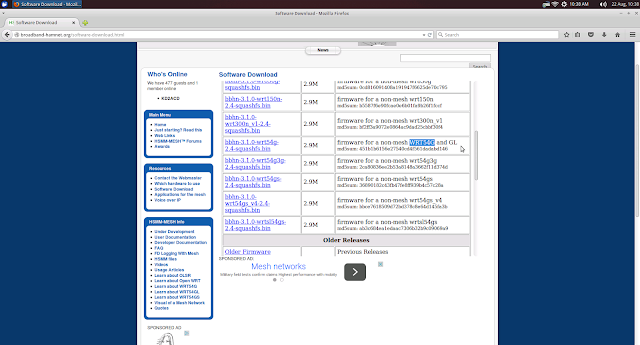 Once you have your file to create a mesh network, you would browse for it on your computer and then click upgrade. After router is upgraded it will reboot and you're all set on getting started to setup your Mesh Network. I'm not going to create an instruction for this. but I am leaving a couple of links from YouTube so that you can see that instruction on how to configure your system. Copyright by KD6VZQ Tracy Thibault. Content can be used so long as you give me credit for content. Simple theme. Powered by Blogger.